Since some of my most popular posts have been my “Better Know Your Hammer” series, I decided that I would make it easy on everyone and list all of them here as a quick reference guide. If you’re new to Hammermarks, maybe you haven’t seen them yet. 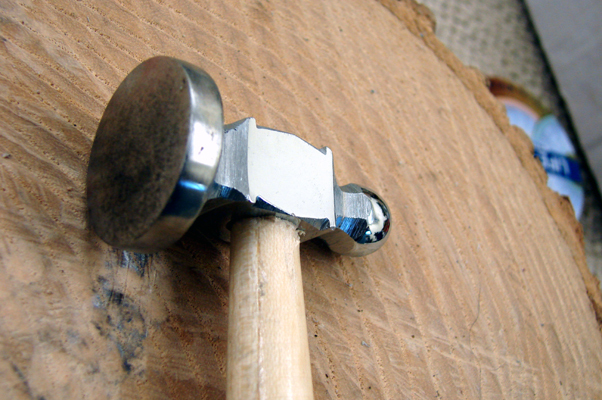 Just click on the photo pf the hammer you want to know more about. If you have any thoughts to share about these or other kinds of hammers, please let us know. 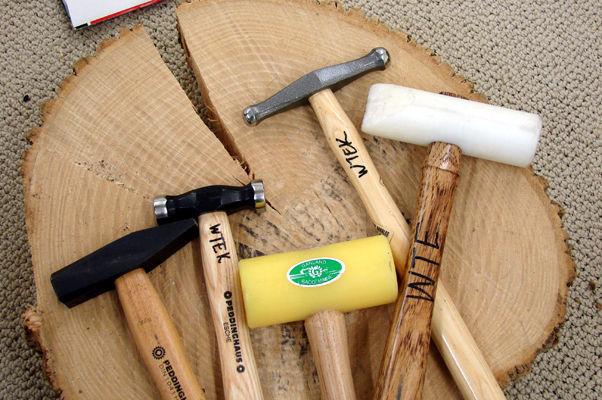 If you have your own favorite hammer, let us know that, too. Link to a photo if you have one. The hiatus is over, my hammer series will now continue. Chasing hammer is a tough one because it really is used pretty much for one thing and one thing only-chasing. The handle is shaped “funny” because it makes it easier to do the kind of tapping that chasing and repoussé require. The broad flat pein makes it easier to hit the chasing tool every time you try. And of course the short nubby end can be used in place of an actual chasing tool. This nubby is the only reason I use this hammer for anything but chasing, I can use it when making tube rivets. Ok, I also occasionally use this hammer when bezel setting stones, but it’s for the flat pein when I use my magical horseshoe nail bezel pusher. For those of you who aren’t too familiar with chasing and repoussé, I’ll give brief description. Please keep in mind that I am but a beginner in this technique and that I haven’t had any more than a brief introduction to it during my art school days. Basically, repoussé is the French word for push and that is exactly what you do, push your metal using a variety of strangely shaped tools. If you want to nitpick, repoussé is when you push the metal out from the back of the piece and chasing is when you work it from the front. Usually you use both techniques when making a design so I try to use both terms. I have been know to just say “chasing” when trying to make it easier for people to understand what I’m talking about. 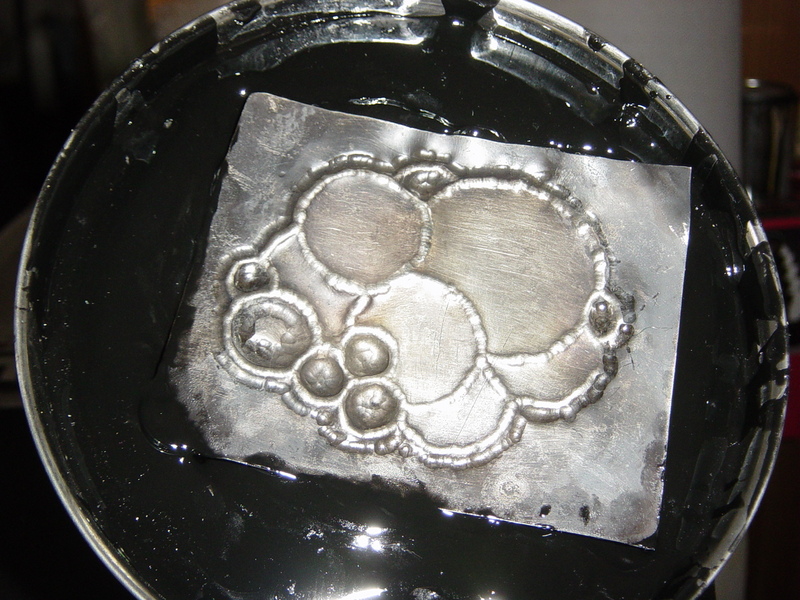 You can start from either a flat sheet of metal (as I did with Bubbles) or work on a formed piece (as I did with my Spiral Dance chalice). Most times you use pitch (something derived from pine tar) as a backing that offers support for the piece while also being able to give as you press into it. This is extremely messy (at least for me), but is how this has been done for centuries. I’ve heard that you can also use hot glue (once it’s dried) or carpet or rubber sheet. But I can’t vouch for these methods. 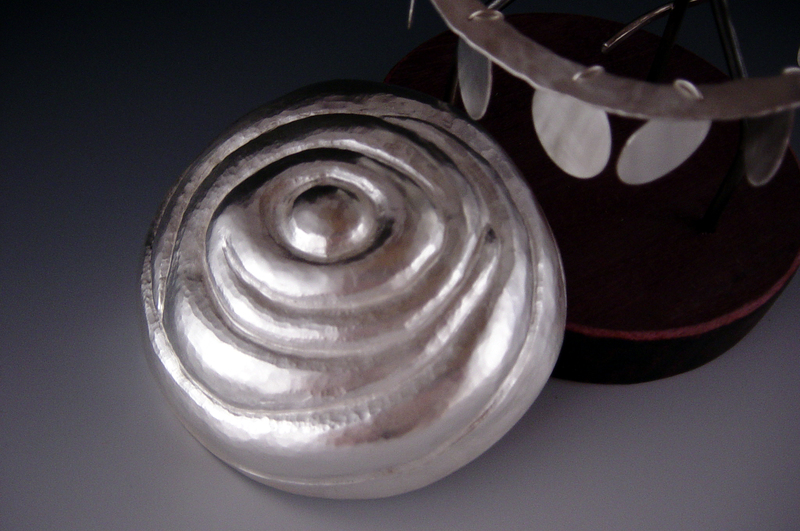 If you want to see work by a master of repoussé, look up Valentin Yotkov or check out one of Victoria Lansford‘s workshops.